← Last chance to save Santa Clara River — 7 days left! LOS ANGELES, CA — Environmentalists have long voiced concerns about Newhall Ranch in the Santa Clarita Valley. The proposed master planned community will include a massive community consisting of 20,000 new homes, shopping centers and industry. Concerns have centered on how construction will have an impact on water resources in the region, wildlife habitat, the endangered Spineflower, and the Santa Clara River. Some consider the latter, which runs through the proposed development, to be Southern California’s last major wild river. Developers of Newhall Ranch are currently awaiting approval of draft environmental impact reports for the first village in the community, Landmark Village, and the river corridor and high country areas. Environmentalists are still making their voices heard. Photographer Peter Goin, research associate Scott Hinton, and environmentalist/animal welfare activist Leo Grillo recently compiled a portfolio of photographs that show the Santa Clara River in its natural undeveloped state. They’re hoping the photos will serve to encourage developers and government officials to further limit Newhall Ranch’s encroachment on the river. He began conducting the photo survey three years ago. He and Scott Hinton have documented the landscape of the whole distance of the river and surrounding environment. They have also taken photos of some of the effects of construction. Goin said his main interest is exploring the importance of rivers running through metropolitan areas and how to preserve riparian – a term that refers to the environment in and around water ways – open spaces. Goin said what he finds most intriguing about the Santa Clara River is its wide breadth and length. He considers preserving the river in its natural state an “overwhelming opportunity” for people in neighboring communities to have a place to find refuge. Leo Grillo, president of an organization called Animals on the Edge and the one who encouraged Goin to do the photo survey, is an outspoken opponent of development on the Santa Clara. He presented copies of the photo portfolio to Los Angeles and Ventura county officials on March 2, 2010. The Animals on the Edge website said the goal of the project is to take the images, together with new, additional photographic works, travel the U.S. in a museum exhibition and eventually compile the photos in a monographed book. Newhall Land, developer and master planner of Newhall Ranch, has gone through a public process about the project for the past 15 years, said Marlee Lauffer, spokesperson for Newhall Land. The final EIR for the whole development was approved in 2004. The company is currently implementing plans for specific components of Newhall Ranch. 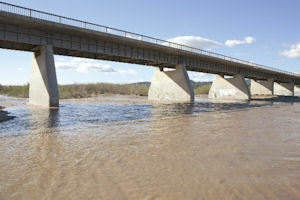 The U.S. Army Corps of Engineers is reviewing public comments on the river corridor and high country draft EIR and should make a decision by mid 2010. That report said, among other environmental initiatives, developers plan to protect the river corridor by creating buffers of native upland habitat 100-200 feet wide to separate the river from the community.